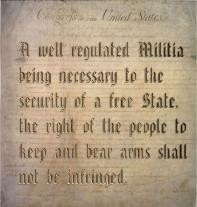 A group of gun enthusiasts led by blogger “Mr. Completely” recently turned their love of firearms into laptop computers for wounded warriors. For the third straight year, the Gunblogger Rendezvous in Reno, NV has made Soldiers’ Angels Project Valour-IT its fundraising focus. In addition to a raffle, the registration form for participants this year included an option of donating to Valour-IT while paying the registration fee. Things got off to a rocky start when PayPal shut down the online raffle that had been set up, but Brian David Crane of Lucky Gunner (one of the Rendezvous sponsors) stepped up to fill the gap, making for a fantastic fundraiser that brought in nearly $7000 from tickets alone. 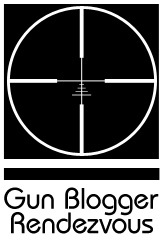 And the gunbloggers didn’t stop there! Thirty-seven blogging participants at the Gunblogger Rendezvous raised additional funds through raffle tickets purchased at the event in Reno, direct donations during the weekend, and funds from registration fees once expenses were covered. At the end of the Rendezvous, event sponsor NSSF announced their direct donation of $1000 to Valour-IT, leading to a grand total of $8243.80 raised for Valour-IT! 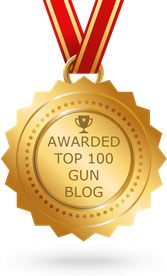 he Gunblogger Rendezvous is an annual “real life” meeting of an online community of about 125 bloggers who discuss firearms and 2nd Amendement issues (37 attended this year’s event). Each year they include a charitable aspect to the festivities, and for the last three years that has been Valour-IT. This year their activities included shared meals with lively discussion, a visit to the world’s largest sporting goods store, target shooting events, and several friendly competitions. Major Chuck Ziegenfuss, the co-founder of Project Valour-IT, was in attendance for the 2nd time and found himself stunned when he pulled his own name out of the “hat” during the 2nd part of the drawing. Soldiers’ Angels is proud and honored to receive such generosity from patriotic Americans who have found a way to celebrate their rights and favorite pasttimes while supporting the troops! 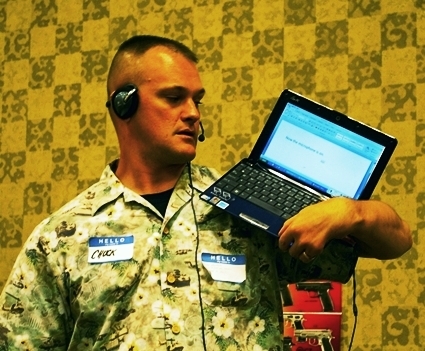 At the Gunblogger Rendezvous, Chuck demonstrates use of the voice-controlled software that wounded warriors can use on Valour-IT laptops.